We are delighted to welcome Cassie to our Leadership Team in the newly created Hospital Administrator Role. She comes to us with a long history of HR, Compliance and Project Management in Human Medicine. She has a four year degree from Metropolitan State University. 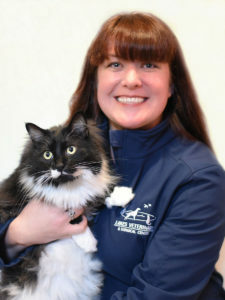 She is excited to combine her business background with her love of animals. She, along with her husband, daughter, dog Jackson and cat Nox reside in Stacy. They also love to travel and go camping in their refurbished vintage camper.